An Airsoft bolt action 6MM sniper rifle, based on the M40A3 Sniper Rifle used by USMC Forces, and is a faithful 1:1 scale licensed Airsoft replica built by ASG.This is a Sport-Line beginner's sniper rifle that is base on the real rifle M404 which is a bolt action and is blessed with great performance.The sniper rifle has been in use with US Marines for nearly 2 decades and this replica is a great starter rifle for any aspiring sniper.This is a true replica and very similar to the real deal. M40A3, has doubles alloy and polymer design with lightweight tough stock that houses the barrel and bolt action. Accurate to the real design, the Airsoft M40A3 uses a lightweight and durable polymer stock, which holds the alloy barrel, receiver and bolt. A RIS rail (20mm) is on the upper end of the receiver and will let users to fit attachments such a scopes and The lower end of the hand-guard has section of 20mm rail which will allow you to fix other accessories and most importantly a bi-pod. The stock has an adjustable cheek rest giving a more comfortable sniping position. The adjustments can be done with the hands and this cuts out fiddling around with Allen keys. The stock length is also adjustable giving a overall comfort to ensure the best position for aiming. It comes with an adjustable Hop-up unit, that is on a ratchet fed so you can feel the positive adjustment and this will allow you to use a variety of bb's. Most snipers use the heavy bb.s and we have some in stock. see our .40g sniper bbs. 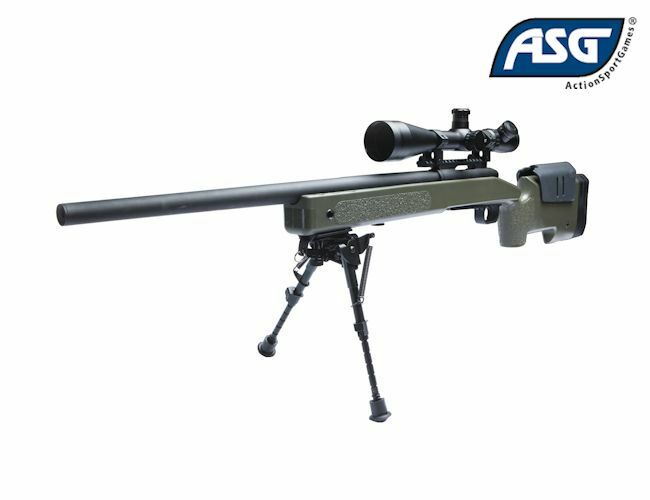 The ASG M40A3 is a great sniper rifle for any grade of player so just take it out of the wrapper, it is ready to use and will give great performance with fun along the way and shoot at 420fps. This gun is tremendous value and hard to beat.If you want to get even more performance then the M40A3 can be upgraded as there are loads of spare parts for it including springs and barrels. You will love this gun and will not want to part with it. Polymer construction with metal barrel. 7 inch 20mm RIS / RAS rail. Lower rail for attaching bi-pods etc. Ratchet Hop-Up for positive feel. Barrel can be replaced by suppressor. Realistic markings with serial number. Adjustable stock for length and pad. Cheek pad is adjustable for height. Bolt System comes in full metal. 6 QD swivel attachments points. Ref. 17212 M150 Upgrade kit,results in a muzzle velocity of approx. 490FPS-149m/s. ref. 17213 M170 Upgrade kit,results in a muzzle velocity of approx. 545FPS-165m/s. Note all upgrades should be undertaken by a skilled person. Note-does not come with scope or tripod.